Fall is here already, but better late than never, here are the details of the hat I made for my friend Eulalia. 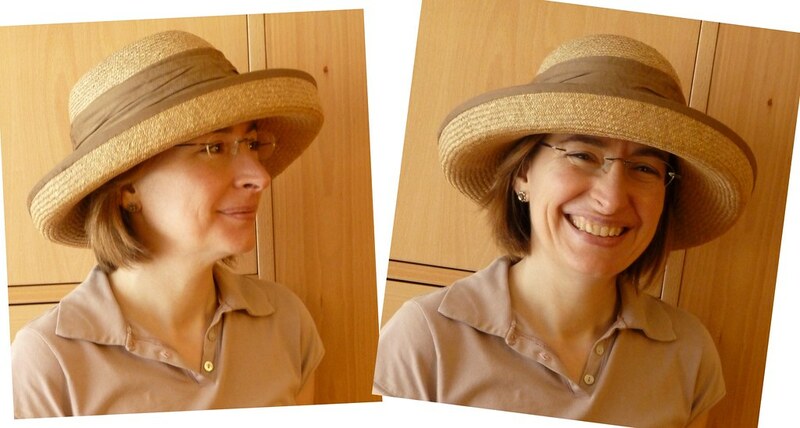 I tried to make a hat that is very wearable, but I suspect that Eulalia thinks it still quite dressy! Here are some pictures of the blocking of the brim. When starting to block it might seem that there is too much material. Do not worry, that material is on the bias and it’s easy to “shrink in”. 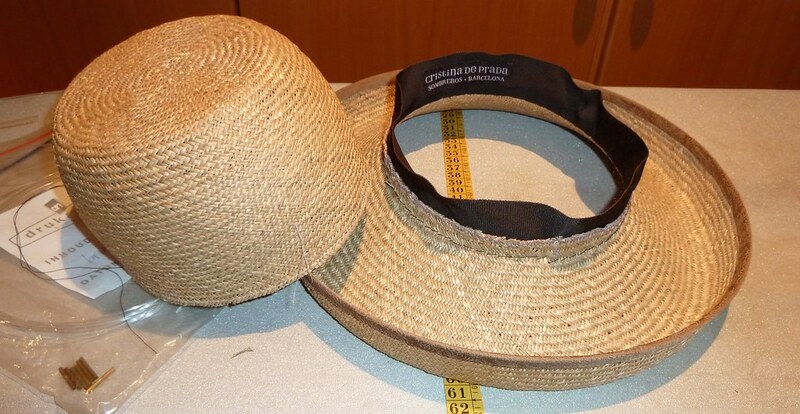 Also important is to keep in mind that when a brim folds upwards (like with a breton style hat) the good side of the straw must be on the underside of the hat (so that the part that folds upwards looks beautiful). 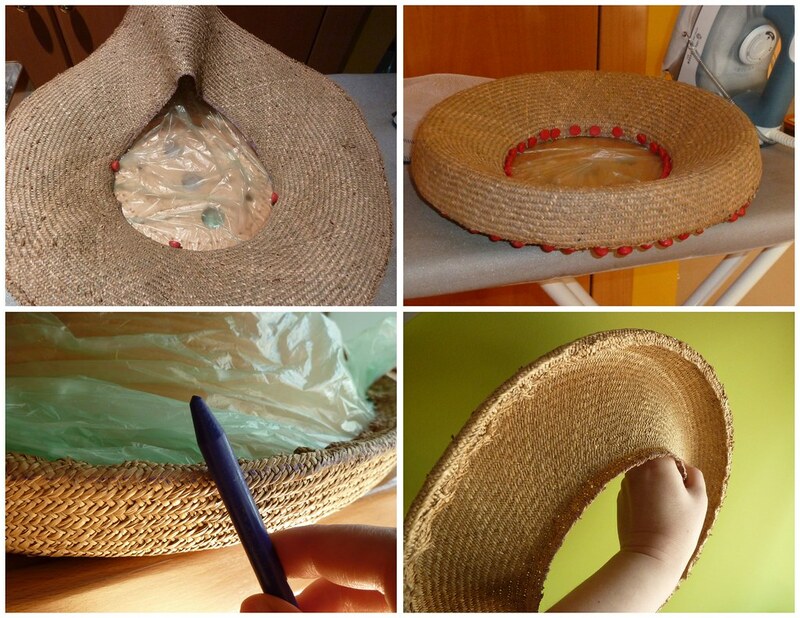 As you can see I used a wax crayon to mark the edge of the brim where I would have to cut. I decided to use “brim lock” (nylon wire) to help keep the brim in shape. I taped it first to the wood block to get the right length (the brim hat stretched a little when unblocking and getting the length from the block means that I will be able to bring it back to it’s original shape). I used a joiner, and with an exacto knife cut the tip into a fine point to be able to enter the ends of the nylon into the joiner. As you can see the ends get squashed when cutting the nylon with scissors. 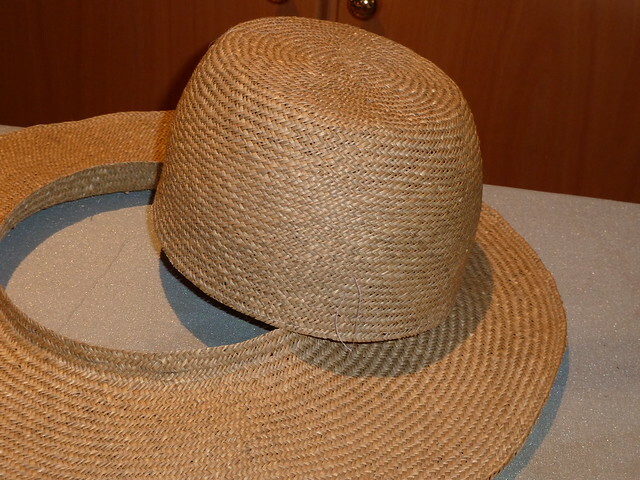 Afterwards I taped the nylon to the edge of the brim and used a zigzag stitch to fix it in place. Yes, you can do that by hand, but the result is very good done by machine and it will be covered with a bias biding. Here is the bias binding process. I do have a bias binder maker, but it’s very easy to make them with a long pin on the ironing board as you can see. I machine stitched the binding to the outer edge and them flipped the binding inside and stitched by hand the inside part making sure that no stitches are visible on either side (the stitches on the outside come out just below the binding, invisibly). The last steps were the grosgrain headsize ribbon (previously curled), hand stitched but because the stitches will not be visible on the outside (covered by the crown) it was ok to do long visible stitches on the outside. Nothing more left to do but to hand sew the crown to the brin, and add the trimming. I hope you enjoyed it! !